Patrick Ryan Division is a growing group of approximately 70 men who mostly live or work in Western Wayne County, Michigan, many from the towns of Canton, Plymouth, Northville, Novi, Livonia and Westland. We represent several Catholic parishes in the area including St. Thomas 'Becket, St. John Neumann, Resurrection, Our Lady of Good Council, and others. Membership application - click the link below to download our membership application. Send all apps to AOH Patrick Ryan Division c/o Tim Higgins, 17518 Oak Hill Dr., Northville, MI 48167. The book Modern Journeys, the Irish in Detroit was published by the United Irish societies in 2001. Jim O'Kelly, a founding member of our division and a Past AOH Michigan State Board President wrote a nice piece in that book about the founding of the Patrick Ryan division. Here is that piece from this book published nearly 15 years ago. 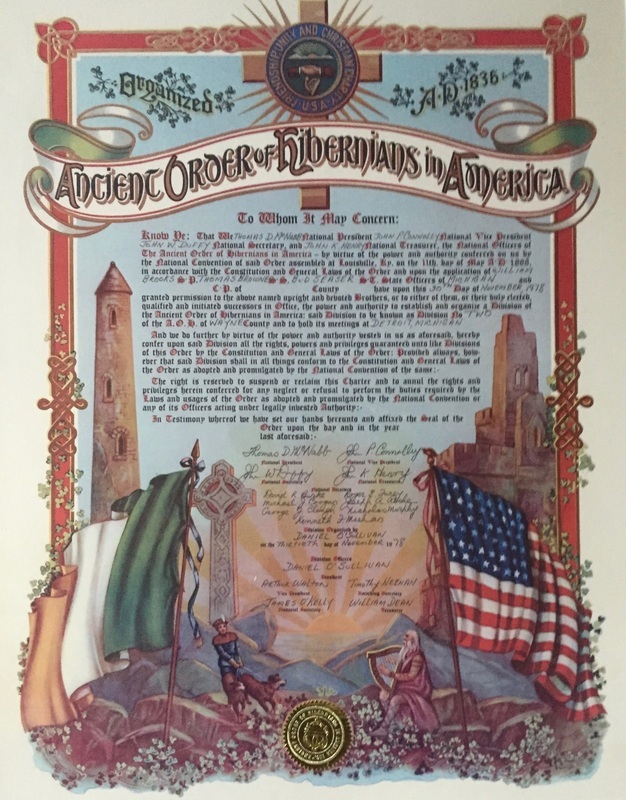 In mid 1970, the Ancient Order of Hibernians in Wayne County sought to gain more voting clout on the national level. The idea was to start a new division that would draw members from some of Detroit's older Irish neighborhoods. The location was easy: Corktown, the oldest Irish settlement in town, dating back to the early 19th century. Many names surfaced, but one man known for his spirit and dedication to his fellow man and Irish community seemed most appropriate: Patrick Ryan. Born in Westport, County Mayo, he came to Detroit as a young man and was employed for many years at the Detroit department of public works. He was also a long time member of the board of trustees for the city pension fund. At the time of his retirement, he had made a name for himself as a tireless worker for retired city employees. He was one of the founders of the city of Detroit retirees Association. Pat's connection to the Irish community was very strong. He served as president of the Gaelic league and also as president of the AOH Amalgamated division. The division flourished in the early years as the membership swelled to over 100 men. The member roster included many of Detroit's finest policemen, firemen and other city employees. The division was also blessed with a series of talented presidents, including Tim Meaning, Bill Dean, Dan McCarty, Dennis Hayes, Jack Derrig, Pat Heany, Dan Riley and Charlie French. They were also fortunate to have had some wonderful chaplains such as Father Joe Tobin of Holy Redeemer, Fr. Tim Hogan USN, Fr. Russ Kohler of Holy Trinity, Father Jim Murphy, and Father Doc Ortman of Our Lady of Good Counsel. Along with growth came an increasing presence in the community. Scholarships were set up with emphasis on helping the needy, not just the gifted. Many underprivileged children from Holy Redeemer, Holy Trinity, St. Leo's and St. Dominic's benefited from these gifts. Through the years the Ryan division hosted many events, notably the midwinter parties at the Lager House on Michigan Avenue in Corktown. As many as 400 people try to squeeze into the small bar in back room. In recent years, the Emerald Ball has taken the place of these parties with attendance increasing at each event. Changing demographics have led the division to move to a new location in Plymouth, on the western rim of Wayne County. There has been a rebirth of interest in Irish heritage, as well as community spirit. Membership has grown and so has community involvement. The Ryan Hibernians now participate in habitat for humanity, coats for kids, and other programs for the needy. Many members are fathers of Irish step dancers, as well as being active in adult dancing themselves. Proceeds from the Emerald Ball are distributed to many charities, including the Cabrini clinic at holy Trinity and the outreach at St. Dominic's Church. The Patrick Ryan division of Corktown is proud to have served Detroit's oldest Irish community through the years and looks forward to participating in future endeavors.